Few pressure washing contractors realize that they are required by law to carry MSDS sheets, and that there are serious consequences if they are caught not complying. If the business operates with employees, the risk is even greater. The Occupational Safety and Health Administration mandates that every business that uses chemicals during the course of operation communicate potential hazards to staff. The Hazard Communication Standard 29CFR 1910.1200 directs that any chemical produced or imported in the Unites States are evaluated for potential hazards. These risks must be reported in a standard format and provided to all employers for distribution and training. 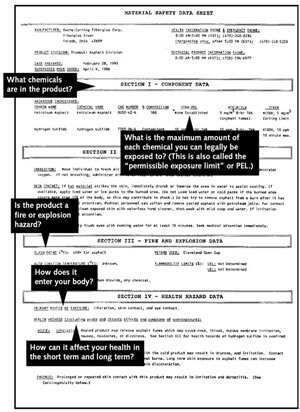 The reports are called MSDS sheets. The information included is usually comprehensive in nature. It must contain both the scientific and common trade names. With the exception of protected trade secrets, it must also contain a list of ingredients. If there is a known health risk, such as with cancer causing agents, then it must be clearly stated. The way that the chemical interacts with other substances is also reported. For pressure washing professionals, the MSDS sheets should also indicate whether or not the chemical is flammable and what the vapor pressure is. In the event of exposure or spills, protective equipment and clean up protocol will be clearly outlined. This is all done according to a universal template, although variations are permitted. This regulation also instructs professionals to identify containers of compounds with hazard labels and to train employees according to the instructions. The Environmental Protection Agency (EPA) pressure washing EPA compliance also has mandates regarding the use of MSDS sheets. The Community Right to Know Law, SARA Title 111, addresses the need to have accurate and timely reporting. Many states have specific laws in place to detail how employers should comply with the regulations. They are permitted to do so under federal law, provided that critical information is disclosed. For this reason, the appearance of MSDS sheets may vary. It may seem like an unnecessary expense, but failing to abide by the law can land a company in serious hot water. Legally, the Department of Transportation can stop any commercial vehicle and ask to see the MSDS sheets. Failing to produce them can result in the vehicle being impounded and heavy fees being levied against the business. Perhaps more importantly, is the very real possibility of someone accidentally exposing himself or herself to a harmful substance. Pressure washers produce overspray or back-spray that could carry cleaning agents into someone's eyes, nose, mouth, or on their skin. If medical attention is needed, it is extremely helpful to know exactly what ingredient someone was exposed to. Implementing a Hazard Safety Communications program isn't difficult. MSDS sheets are provided free of charge from distributors. If the seller is a retail operation, then they should be able to provide the telephone number of the manufacturer. Obtaining it in this manner is also free. They can be copied and stored in vinyl covers, then compiled into a three ring binder. The notebooks should be kept inside of each vehicle that is involved with the company. It needs to be periodically updated to ensure the most current information is on hand. Employees should be given a written notice as to the location of the binder. In addition, a simple training plan can address each risk element and the location of protective equipment. Emergency procedures should be reviewed in detail, along with the procedure they should use for reporting accidents to the business owner. Compliance with this law may seem like a hassle, but it is something that is worth doing. Think of it as being a bit like buying insurance. A pressure washing professional may never have the need for it, but they are protected if they do. The key to strong and lasting relationships. Emissions requirements affect the cost of equipment.